This American classic has become one of the most popular Paris bistro salads. Why? Perhaps because the dressing is quintessentially French — it’s an embellished mayonnaise. 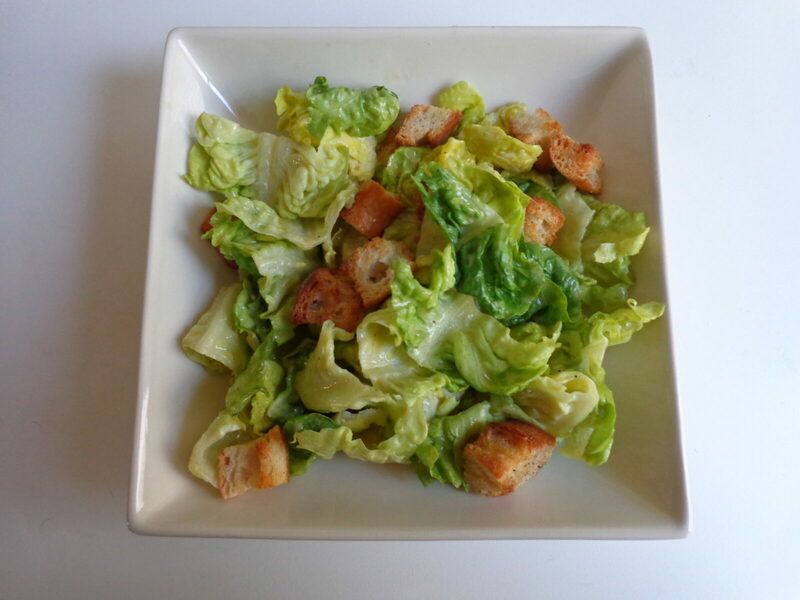 For success, make the croutons ahead of time and be sure all the ingredients for the dressing are at room temperature before you begin. To turn your salad into a chicken or steak Caesar, grill the meat just before serving. Slice thickly and place on top of the tossed salad. Make the croutons. Set aside. Chop the romaine crosswise into strips about 2 inches (5 cm) wide. Wash, spin dry and set aside in the fridge. Combine all the remaining ingredients except the cheese in a blender (hand-held or countertop). Pulse until you have a thick, emulsified sauce. Transfer to the bottom of a large salad bowl. Stir in the cheese. Five minutes before serving, return the croutons to a preheated oven to warm them. Place the chilled romaine on top of the dressing. Toss. Add the croutons. Toss again. Serves 4 as a starter, 2 as a main course. The dressing is superb. So much tastier than any I have had in a restaurant. Thanks for the great recipe, Meg. Perfect dinner for a hot summer evening.